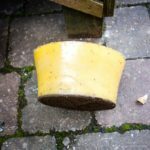 Wax can be relatively easily reclaimed from used frames, brace comb, cappings and – depending upon the quality – used for candle making, cosmetics, polish or traded in to buy foundation. 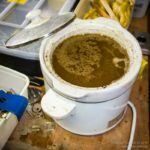 Since I’m not interested in producing show quality candles or preparing vast quantities my wax processing routine is relatively simple. Frames (brace comb, failed candles etc.) for processing are loaded into a home made steam extractor. 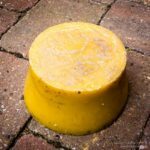 The molten wax is collected in a honey bucket containing a small amount of rainwater. 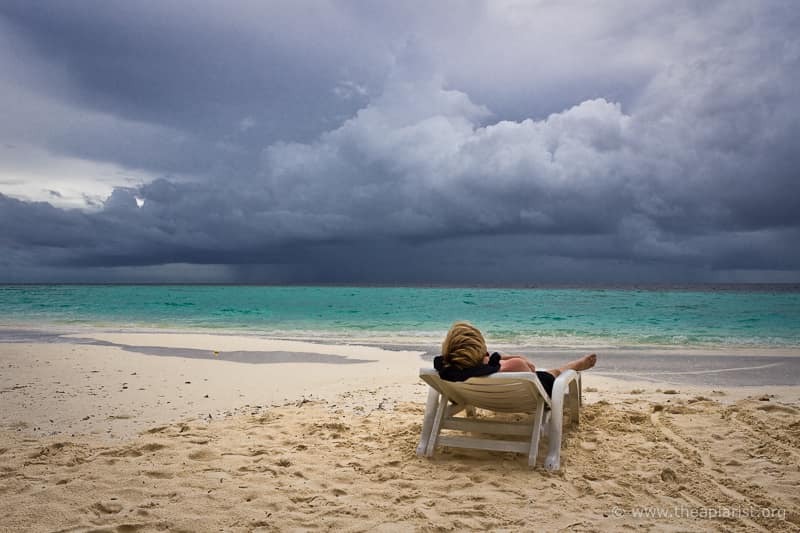 If the frames have large amounts of stores, pollen, brood etc. in them the bucket will also contain all the big bits not filtered out … and can be pretty messy. 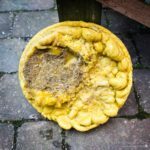 After a couple of rinses in clean water the set wax disc is broken into pieces and added to a slow cooker containing a couple of centimetres of rainwater. Slow (Slo?!) cookers go in and out of fashion and can be picked up at car boot sales or via Freecycle easily and/or cheaply. After a few hours on the ‘high’ setting, perhaps with the cooker being topped up with additional wax, the slow cooker is turned off and the wax allowed to set overnight. The resulting wax block can easily be tipped out and the dirty water discarded. The bottom of the block usually has a layer of crumbly propolis that has collected at the water/wax interface. 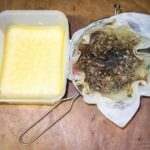 Scrape the propolis off with a hive tool or paring knife to leave a block of sufficient quality for trade-in for new foundation. 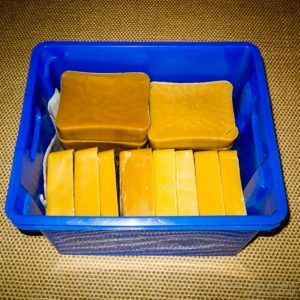 The resulting wax blocks are easy to store and of good enough quality for preparing furniture polish and day-to-day candle making. Darker ones are used for homemade foundation strips or traded-in. 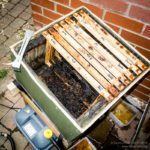 This entry was posted in Beekeeping, Wax and tagged candles, foundation, frames, polish, wax, winter on April 24, 2015 by David.